You'll never found a more loyal Decepticon to the cause than Soundwave. 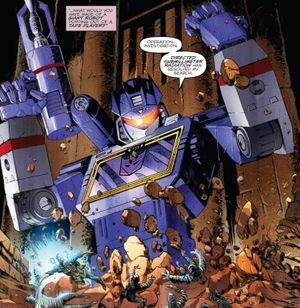 An extremely and unusually powerful telepathic Outlier, Soundwave fell under Megatron's sway and became dedicated to him and his cause to create a galaxy built on the concept of Cybertronian equality, remaining loyal even as that cause began to be forgotten in favor of conquest and totalitarianism. When Megatron defected to the Autobots, Soundwave realized just how much the Decepticons had lost their way and teamed with Galvatron to rebuild the Decepticons in the name of peace only for Galvatron to try and create a new empire. Forming an alliance with Optimus Prime, the two overthrew the tyrant and now work together to try and uplift Earth into the cosmic community. While he first viewed humans as nothing more than short lived and expendable drones, he's slowly starting to get better around them. Slowly. After the war ended and a repentant Megatron announced that he had decided to become an Autobot, Soundwave was shocked that the man he had trusted and loyally served for so long could betray the cause he founded like that. This eventually made Soundwave realize just how much the Decepticons had lost their way, prompting him to take command of their remaining forces alongside Galvatron in hopes of redeeming the faction. Though he regarded humans as lesser lifeforms, Soundwave sought to make peace with the people of Earth in hopes of gaining access to the planet’s energon supplies. Making contact with the newly formed Earth Defense Command, Soundwave informed them that the Decepticons had abandoned their warlike ways and successfully convinced them to help in the construction of a Decepticon commune in orbit of Jupiter. This character article is a stub and is missing information. You can help IDW Hasbro Wiki by expanding it. This page was last edited on 27 November 2017, at 18:35.